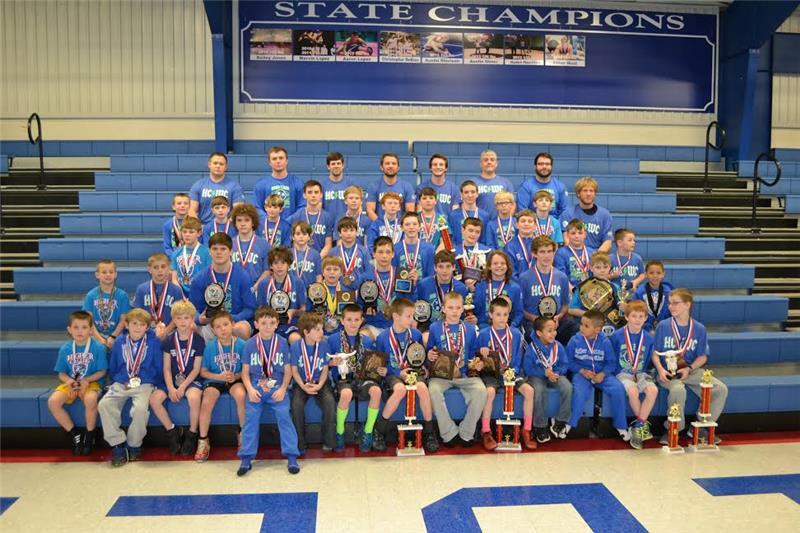 Cleveland’s Higher Calling Kids Wrestling Club was the 2015 Tennessee AAU Middle State Champion and overall team champion for the second consecutive year. The team is pictured with its coaching staff. 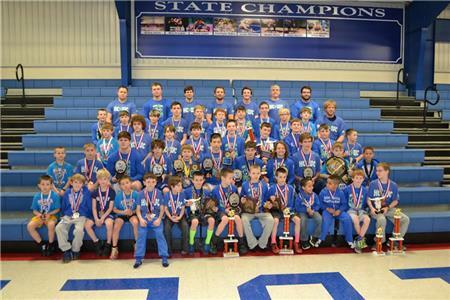 Following on the heels of the Cleveland Blue Raiders winning a third consecutive state championship, the Higher Calling Kids Wrestling Club also dominated the Tennessee AAU State Championship tournament held over the weekend in Cookeville. The club, coached by Josh Bosken, accumulated a total of 635.5 tournament team points, which is up from 440.5 points scored a year ago. Higher Calling was the 2015 Tennessee AAU Middle State Champion and overall team champion for the second consecutive year. Higher Calling is a wrestling program that gives young wrestlers of all skill levels, grades K through 5, a chance to learn the essentials of practice and competition. Bosken said the club had 55 kids from the state participate in the state tournament - up from 29 a year ago – and had a historical record of 33 state placers, 18 finalists, and 12 champs. After the victory, Bosken offered a special thanks to Check Into Cash and its founder and CEO Allan Jones. Along with purchasing a bus for Higher Calling, the Allan Jones Foundation and CIC act as the primary funders of the club, paying for whatever needs arise, he said. "This enables those who aren’t financially able to wrestle to do so through a matching program. The company was the sole funder of the team’s trip to the recent state tournament in Franklin to see the Blue Raiders win another state title," Bosken said. Bosken said the Foundation matches every dollar the wrestlers raise. For Jones, he said it is a gift that needs no explanation. Jones said he puts an emphasis on quality coaching. Dawn McDaniel, a Check Into Cash employee who manages the company’s national Vehicle Appraisal Assistance Center, is the parent of Higher Calling’s Trae McDaniel. She says the club is important because it provides an opportunity for kids who otherwise wouldn’t be able to compete. Bosken said Cleveland’s road to dominance began in 2006, when the Allan Jones Foundation donated $50,000 to the city school system to hire the athletic recruiting firm Double Pump International so that a national search for a coaching staff could be hired to replace the retiring Al Miller at Cleveland High. New coaches were hired for the high school, middle school and kids club, and the foundation implemented a “six-year plan” designed to guide the Cleveland wrestlers to a championship. Mike Hatcher, a graduate from the University of Iowa, was brought in to take over the Kids Club. Bosken, who also helped Eslinger, joined him. When Hatcher left, Bosken settled into the Kids Club coaching role to ensure the Cleveland pipeline would stay full. "The concept back in 2006 was that in six years, the sixth-graders would be seniors and would have come through the system installed by coach Heath Eslinger and would win the state championship,” Bosken said. Prior to the implementation of the six-year plan, Bradley Central High School had served as a long-respected state powerhouse, and had beaten Cleveland in competition for 19 consecutive years. For the past four years, Cleveland wrestlers have defeated their crosstown rivals, Bosken said. Bosken said that as his team watched the high school athletes win in Franklin this year, the Higher Calling squad was reminded of what it takes to win.